The EMTRAC components are listed in three major categories—vehicle equipment, wayside equipment (installed at signal-control cabinets or carried by roadway workers), and the software used to configure and monitor the system. Each equipped train carries a Vehicle Computer Unit (VCU), which connects to a location/communications antenna that is mounted on top of the train. The VCU contains a precise navigation engine that calculates precise vehicle position based on both GNSS and inertial positioning. The superior radio range of the VCU ensures reliable V2I (vehicle-to-infrastructure) communication—even in the most challenging conditions. The EMTRAC system offers a wide range of vehicle and wayside functions to meet transit agency needs. These functions include Transit Signal Priority (TSP), Over-speed Protection, Collision Avoidance, Event Monitoring and Alerts, and more. Wireless communications range typically exceeds 3,300 feet (1,000 meters), and transmissions utilize 900 MHz, FHSS radio with secure 256-big AES encryption. Vehicle components run off nominal 10 to 40-volt DC power, with maximum current draw of 500mA. VCU computer board includes an ultra-fast processor and high-capacity memory, and the integrated MicroSD card provides additional storage capability for activity logs. Device communication is performed through Ethernet, RS-232, USB, or wireless RF connection. Capable of storing up to 5,000 vehicle detection zones. Supports up to 16 inputs and outputs in any combination, which includes the four common directional codes and four auxiliary codes. Accepts multiple inputs to facilitate priority-request functionality, including schedule adherence, train-door status, passenger count, and others. Configurable time-out function enables train VCUs to cease transmissions after a specified amount of inactivity. The Control Head, which is mounted in view of the train operator, enables real-time monitoring of system activity. Operators may receive collision-avoidance alerts, roadway-worker alerts, over-speed alerts, In addition to other information provided by the Control Head. There are three different Control Head models. The LED model (upper left) provides indicators for basic system status. The Touchscreen model (upper right) provides train-activity information and safety alerts, such as worker notifications. The Programmable model (bottom) provides train-activity information, safety alerts, and enables updates to VCU-configuration settings. Safety: Reduce the chance for accidents by pro-actively alerting drivers of potential hazards. Efficiency: The Programmable model is equipped with a USB port, enabling agency personnel to load only intersections and detection zones for specific routes. It is also equipped with an Ethernet port, which may be used to download data or upload firmware updates. Reliability: The Touchscreen model enables operators to reset timed-out requests to help clear signals even in gridlock conditions. Flexibility: The EMTRAC system may be installed on any train or vehicle type (including LRVs, commuter trains, buses, first-response vehicles, snow plows, and so on). 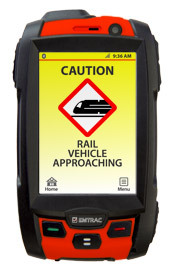 The EMTRAC wayside equipment includes the cabinet-mounted Priority Detector, the Omni-Directional Antenna (which is typically pole-mounted), the Personal Notification Units (PNUs), and the optional Interrogator Kit, which automatically downloads activity logs and installs firmware updates while trains are out of service at rail yards. 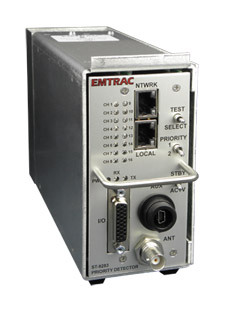 The EMTRAC Priority Detector includes a single-board computer and 900-MHz FHSS transceiver integrated in a dual-card assembly, which is rack or shelf mounted in wayside controller cabinets. The Priority Detector allows for calls to be received for multiple phases from EMTRAC Vehicle Computer Units, supporting up to 16 inputs and 16 outputs. 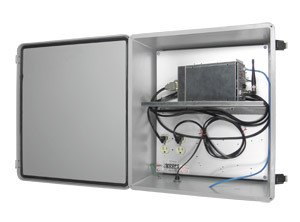 It is compatible with NEMA, 170/2070, Caltrans, ITS, and custom cabinets. The EMTRAC Omni-Directional Antennas are ground-plane independent and provide 2.15 dBi gain performance. They can be mounted in a variety of locations, with antenna wiring encapsulated to provide extraordinary resistance to severe weather conditions. Ethernet communication enables remote monitoring of train and signal-controller activity, a history of network-connectivity status, and provides for configuration of EMTRAC equipment through the existing rail network. Compatible with all major controller cabinets and brands, including NEMA, 170/2070, ITS, Caltrans, and custom cabinets, and it operates on 120 VAC with its own power supply. Provides for a total of up to 16 inputs and 16 outputs, with one auxiliary output serving as a satellite-timing signal. Includes channels—and corresponding LED-indicator lights—to report status for power, direction of channel or signal, signal received, and active-output by priority. Enables manual testing of detection functions and controller responses through Test and Priority toggle switches. 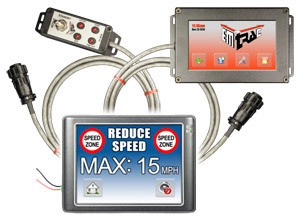 The Standby/Active switch allows for configuration and testing while not affecting live signals. 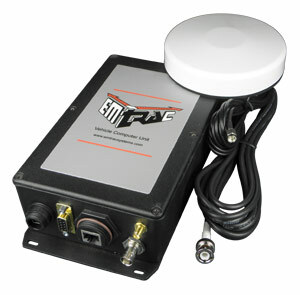 The EMTRAC Interrogator Kit contains an enclosed communication device, antenna, and cabling to facilitate automatic transfer of data between operation-center locations and equipped trains. As trains return to the rail yard, the Interrogator queries the fleet and transfers activity logs for viewing on the Central Monitor software. In addition to log downloads, the Interrogator also transfers updates to the trains, including VCU configuration settings, vehicle-database changes, or firmware updates. Transfers are made via secure AES-encrypted FHSS radio. Additionally, the Interrogator can query Personal Notification Units (PNUs), which are carried by rail workers and returned for charging after shifts. Fully Automatic: Wirelessly transfers detailed activity logs and uploads database or firmware updates to remote vehicles and notification devices (PNUs). Informative Diagnostics: Operations center personnel can monitor the progress of data-transfers as they occur. Agency personnel can also view connectivity history (between the Interrogator and system components as well as between the system server and Interrogator). Auto-Notifications: The Central Monitor software may be set to periodically email activity logs to designated agency personnel. Communication Stability: In cases of network interruption, data is not lost. When connectivity is restored, data-transfers resume from the point of interruption. Timeliness: Rapid data-transfer rates require minimal time to retrieve logs and transfer updates, allowing agencies many options for where to install the Interrogator (for example, near washing stations or maintenance areas). Easy Installation: The minimal number of wired connections keeps installation simple. The kit requires only 120 VAC power and Ethernet—while all communication with EMTRAC vehicle and notification units performed wirelessly. Limitless Memory: Because data is regularly transferred to the system server, EMTRAC vehicle and notification components are able to continually store new log entries. Flexibility: The EMTRAC Interrogator may connect to various antenna types, allowing for the most reliable antenna for the given conditions. It may also be mounted indoor or outdoor, on wall, pole, or other structure. As the number of rail lines through metro areas increase, so does the potential for roadway accidents—and wayside rail workers are often in the most vulnerable locations. By utilizing precise satellite positioning and secure FHSS radio, the EMTRAC Personal Notification Unit (PNU) alerts rail workers when an approaching train is within a specified distance. When the train reaches this distance, the PNU flashes an ultra-bright LED, sounds a pulsed alarm, and/or vibrates to alert the worker of the approaching train. The PNU may be carried on a belt or in a vest pocket and includes multi-constellation satellite and inertial navigation, a UHF transceiver, and a panic button that enables workers to notify team members of critical situations. Each PNU has its own ID, which may be assigned based on worker IDs. The PNU logs worker activity, alert details, and the ID and speed of approaching trains. Alerts may also be customized to activate based on the Estimated Time of Arrival (for the train to reach the worker). The PNUs ship with charging components and contains a 12-hour lithium-ion rechargeable battery to ensure reliable operation through work shifts. While the EMTRAC system is relatively simple to set up, it is also robust enough to handle complex customized applications. The EMTRAC software comprises two core systems, which enables transit agencies to take full control of their rail management system. The Systems Manager software is used to configure all components of the EMRAC system. It is where you define the trains, crossings, intersections, and zones that will be utilized for your system. It is also where you specify how the train and wayside equipment will respond in different scenarios. 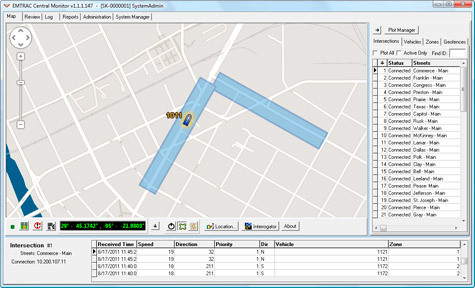 The Central Monitor software is an Automatic Vehicle Location (AVL) service that displays detailed train, signal, and worker activity in real time. Operations Center personnel can monitor real-time train progress, access activity logs, retrieve diagnostic information, and much more. Complete map display of metro area, including rail lines, showing real-time equipped train, signal, and worker activity (if applicable). Ability to monitor train "events" by user-definable types. For example, when used to monitor light rail activity, the system can be set up to log speed-zone violations (as described in the Rail Line Safety video). May be set to trigger audible and pop-up alarms to notify supervisory personnel of critical events (for example, a light rail vehicle on the wrong tracks). Auto-generates user-defined reports, which are then saved automatically and may also be emailed to defined personnel at specified intervals. Verify proper system functionality by monitor signal-controller responses to train requests and by remotely checking EMTRAC system diagnostics. Detect and confirm proper crossing-gate closures. If a gate fails to close, an alarm may be sent to both the train operator and the operations center. Ease of Monitoring: Know where equipped trains and workers are in real time. Safety: Alert monitoring personnel about potentially unsafe train activity in real time. Low-Maintenance: Reliable train positioning and RF communication requires no costly in-track loops or switches. Timeliness: Improve rail-line schedule adherence by requesting signal priority when agency-defined conditions are met. Flexibility: Customize train-detection zones and system parameters to transmit your desired safety alerts and train-activity data. Reporting: Generate detailed train, signal, and worker activity reports, as well as system connectivity reports. Security: AES-encrypted FHSS radio offers system security, expansive range, and transmission reliability. Accuracy: The most advanced GNSS navigation engine enables monitoring of train activity with precise and current location data.